13 Ways to Resist Translation Rates Erosion – tranfree 70.
listen to tranfree 70 or download the mp3 for later if you prefer. Editorial – Giving away our translation work? The Times newspaper has decided that enough is enough and is ending free access to its content on the web. These are results of globalisation â€“ a process in which translators usually stay in the background like ghost-writers. Letâ€™s remember there would be no globalisation without translation. Does this overtone of undermining sound familiar? Isnâ€™t that what we do when we agree to a low rate or disastrous terms for a translation job? My feeling is that it is time to stop giving away our translation work. Thatâ€™s because we feel that we are undermining the value of our translation, undermining the value of the profession and undermining the perception that translation and documentation has a value. Well, itâ€™s food for thought anyway. Be careful how much you are giving away in terms of discounts, lowered rates and ever quicker turnaround. It looks to me as if the Times are moving towards a web-only publication, as printed circulation dwindles and people spend more time online. It will take a few years for people to get used to the idea. This makes me ponder the question â€œHow can we take steps to ensure that our work is valued?â€ This fits in very well with the article I had planned for this edition, which is all about resisting rates erosion. Thanks to Wenjer Leuschel, we now have the last couple of tranfree editions in Chinese. I have had one or two technical hurdles to get this published in HTML but it works beautifully in PDF. One other thing I almost forgot to mention is that I have given the www.translatortips.com web site a new look. This is the first revamp for a long time. It’s a much cleaner look. I’ve still got lots of sub-pages to go, but the main ones are done. Feel free to check it out and let me know if you like it. Erosion is a gradual creeping process. In the UK we have had a steady erosion of civil liberty for quite a long time. Because it happens gradually, in small, digestible steps, â€œthey get away with itâ€. Â Itâ€™s the same with rates erosion. It happens in small steps and is only hindered when people see it for what it is and resist. But just because one person resists, another may not. Then we find ourselves being undermined â€“ just like in the BBC article about the Times. So resisting rates erosion is something which needs to be done collectively if it is to be effective. Working for a cause you believe in. In this case you might donate your work or work for a reduced rate. But donâ€™t let them push you around â€“ fit it in around your paid work. Long-standing direct clients who you can see are experiencing hardship. Pretty much any other reason just allows someone else to collect the profits on your work. So donâ€™t do it! and translators without work on the internet. Well firstly, you need to be a little bit careful about taking everything people write on internet forums too literally. Some people exaggerate, some people lie and others are sociopathic. Talk is cheap in cyberspace. Try to filter what you read and only accept advice from people who have a record of giving good advice. Here are a few pointers to help. 1. Can you live on it? Do not accept work for a rate which is lower than you can comfortably make a living at. (Unless this is a charity or pro bono project). It is better to write off a working day and decide to relax and enjoy being FREE, than to work for a ludicrously low rate. the client provided you with an expensive productivity-enhancing tool. a long-term ongoing project with 100% matches (like a product manual that is updated annually). where the client provides you with a significant translation memory which contains plenty of 100% matches. …but observe the golden rule. Anything I work on, I get paid for. …so you have too many clients. Then dump the ones who are fussy and resistant to decent rates (usually the same people). This is an ongoing business development process. As you get busier, you can afford to dump the clients you prefer not to work for (for whatever reason). …instead of always working for agencies. A healthy freelance business has a mix of both in the client portfolio. Clearly there is a lot more income potential in working for direct clients, but their expectations are different too. 5. Charge direct clients more. With direct clients, make sure that you charge significantly more than your agency rates. Otherwise you are guilty of spoiling the market for agencies and, in-turn, other translators. Yes, you might find you are partly responsible for spoiling the market because you lack the confidence to ask for more. Be aware of approximately what other translators working in your language combination charge for the sort of work you are quoting for. If you donâ€™t know, find out. Ask people, read surveys, or ask for quotes from other translators. It neednâ€™t be difficult to get the information you need. 7. Donâ€™t expect to get every project you quote for. If you get everything you quote for, youâ€™re charging far too little. If you are charging what the market will bear, you should get somewhere between 30-60% of the work you quote for. 8. Donâ€™t feel like a failure when you donâ€™t get a project you quoted for. If they chose someone cheap, they probably got what they deserved and you avoided working for a client with poor judgment. That means you WON! You donâ€™t want a portfolio chock-full of cheapskate clients do you? I donâ€™t. 9. Donâ€™t be afraid to talk about rates. It is neither unethical nor likely to result in anti-trust action â€“ despite what some people in the US would have you believe. But be sure you donâ€™t breach client confidentiality. Some people say it is unprofessional to talk about rates. So itâ€™s OK to talk about rates with a complete stranger, who might have a job for you. So why would it be unprofessional to compare notes with others in your profession? Simple answer â€“ Itâ€™s NOT! If it were, why do so many professional translatorsâ€™ associations around the world produce rates surveys? Is it because theyâ€™re unprofessional? …propagated by people who really donâ€™t know what theyâ€™re talking about. Talk is cheap. There are people out there who hang out on internet forums for the sole purpose of annoying, disturbing, disrupting and making others feel uncomfortable. They are the terrorists of the online community. If it werenâ€™t for them, there would be no need for moderators. They are the only reason that we embrace the self-imposed censorship that is moderation. 11. Develop an abundance mentality. Learning about marketing and experimenting with new ways. Learning new skills to make you more productive. Learning new specialisations to give you an edge. …and encourage them to set their rates at acceptable levels. It takes a certain leap of faith to do something like this, but believe me, what goes around comes around. If you help people, you will benefit from it. 13. Educate clients and potential clients about translation. So thatâ€™s the 13 ways to resist rates erosion that I thought of. Not all of them will apply to all people. Iâ€™m sure there are plenty more. If youâ€™ve got one to add, or youâ€™d like to discuss or comment on this article, feel free to add a comment below. Wotan, the bald eagle I photographed earlier in the year did a runner (more of a flier actually) at the weekend and ended up in Bristol, landing on a girl’s hand. Unfortunately she was not wearing a falconry glove so got a bit cut up. And here’s the naughty boy himself. Freelance Translating Without the Internet? A few weeks ago the majority of Europe’s airspace was closed for a week because of the Icelandic volcano eruption. Many people were forced to consider other travel options. Some people in the blogosphere have been pondering what the world would be like without air travel. Life would not be the same at all. It’s not until something we take for granted is taken away from us that we realise just how much we rely on it. I thought it would be an interesting exercise to imagine what freelance translating would look like if we took away our equivalent of airspace, which is cyberspace â€“ i.e. the internet. Eeeeeeeeeeek! Don’t go there! If you wanted to buy an ebook, you’d have to make a phone call or send a letter and we’d have to mail you a disk. That business model would no longer be viable. We would not be able to publish tranfree because there would be no email. You would probably have never heard of either of translatortips.com anyway. Having no email would hurt translators even more because it has become the mechanism for sending and receiving work. Before that, we had to use the postal system, fax, or direct modem to modem file transfer through phone lines. That only stopped about 10 years ago. Anyone remember the Zmodem protocol on WinComm? And the painfully slow 28.8 kbps file transfer? Of course, the upside of losing email would be no spam. D’you know what? Annoying though it is, I’d rather have email with spam than none at all. Having no web sites would be equally traumatic. What would you do when you want to find out the usage of a term you’re not very familiar with? Go to a specialist bookshop? Phone a friend? (Fifty fifty? 😉 What would you do when your five-year-old asks you a hard question? No google, no answer. Go to the library? Yes. The web allows us access to all sorts of stuff we could only find by going and looking in the physical world before. It saves us a lot of time. But the internet giveth and the internet taketh away. For every time-saver on the web there are loads of time wasting activities that spring up to fill their place. Without Skype or Yahoo messenger (and all the others) we would be paying full price for all our international phone calls. Actually, I think we’d be making a lot less phone calls altogether. This would make collaboration harder and more costly. We’d also be in touch less often with friends and family abroad. Perhaps this would make us more efficient in our communications? Is it possible that we are in touch with others too often and too much these days because it’s cheaper? If we had no Skype or email, perhaps we’d write more letters? When was the last time you sent someone a personal letter? I can’t even remember. Without web-based software, and free trials, we would miss out on a lot of excellent productivity enhancing tools. Many of those lovely software applications that make our lives more productive would probably never even have been created because there would be no viable publicity or distribution system for them. No facebook, no ProZ, no internet forums to discuss work, hobbies or whatever floats your boat. These sites are all useful in their own ways, but the inability to network with others would make translation an even more isolated profession. Being able to talk to other people â€“ even through text-based forums â€“ is a really helpful way to develop relationships with people you would otherwise never â€œmeetâ€. It’s also a great way to have a short break when you’re half way through a translation that makes you want to go to sleep. They are the fun side of the business. I vote we keep the internet. It’s pretty useful! The title says it all. I bought a new Dell Studio 1557 in November 2009. Lovely full HD WLED screen. Delighted with it. The only probem is (was) whenever I load up a DVD, after about a minute of playing, it starts juddering and the picture and sound go intermittent. I also had a problem burning a DVD recently when the same sort of thing happened. Then I loaded up a DVD and watched it for about 10 minutes with no issues. Hallelujah 😀 It works just like it should. Well I recently bought this Canon Pixma MP640 and it prints photos beautifully. But the downside is that it takes 5 cartridges (ink tanks) and they cost about ten pounds each (a bit less if you shop around). Now I don’t want to have to restrict my printing out of photos because of overpriced ink (£2/ml – that’s more than most perfumes), so I have evaluated a couple of alternatives. I did a bit of web research. Someone on one of the online forums I hang out on suggested a continuous ink system. That led me to City Ink Express. When I got there, I saw their refillable system and rather liked the look of it. 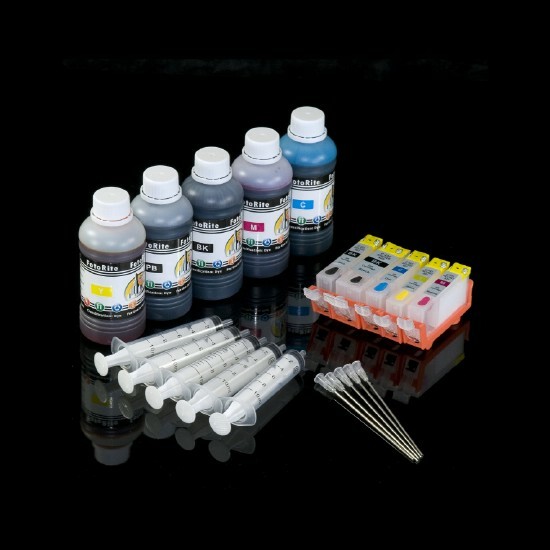 They sell a kit which includes ink tanks with auto-reset chips, 100ml of each ink (FotoRite) and 5 syringes with blunt needles for tank filling. Instructions were good and there are even online videos to guide you through the process. I bought one. It cost me £50 + ~£5 postage and arrived promptly. As the original Canon cartridges ran out I replaced them with these. I filled the cartridges according to the Durchstich method, installed them and cleaned the print head, sent a nozzle test page through the printer and then printed out the same three test photos (on the same paper of course – also remember I’m still using the Canon photo black – but that’s the same for all three tests now). So here are the results. I captioned the photos this time. Each set of three was photographed in one shot so the lighting for each is identical. I did a blind test with Tomek and Malgosia, putting the three photos in random positions and asking them which they liked the best. Tomek picked three out of three OctoInk image specialists. Malgosia picked one Octo outright winner and the other two she couldn’t choose between the Canon and the Octo. Butterflies with macro ring flash. Went to butterfly world in St Albans yesterday. Quite a good setup they’ve got there. It’ll be even better when the dome is done. At the moment they have a big greenhouse, which is very warm and humid. My camera lens steamed up to start with. Had to let it warm up a bit and then clean with a lens pen. Perhaps I’m getting fussy, but I wasn’t all that pleased with the results with macro flash. The natural light ones from Zgierz seem to be better. Stupid thing is, I probably could have shot some natural light ones as I had a 55mm macro lens with me too. Didn’t even think to try it. 🙁 I was too busy trying to get greedy amounts of depth of field with the ring flash which I haven’t really used very much. Probably needs some sort of diffuser on it, as it was a bit harsh. OK, so normal people might think they’re quite good, but I think they could be a lot better. As usual, images can be clicked for a larger version.